After meeting in Riverside on October 28th, we decided to have breakfast, particularly the hashbrowns, at The Soup Shoppe in the Brockton Arcade before riding toward the town of Julian in San Diego County. I had a serving of hashbrowns at the restaurant in the spring of this year. I rated the potatoes at 99%. Nearly perfect. I told Mike Harmon about them and we conspired to take the riding group to the restaurant for breakfast, but one thing and another got in the way and it took several months to actually do it. Only three of us were riding that day; Mike, Tim Devantier, and me. Tables on the lower floor of the restaurant were full, so we headed up the stairs to find a table on the balcony. As we went up the stairs, a waitress took our coffee orders and we had our mugs within a minute of sitting down. We all ordered breakfasts that included hashbrowns and gave the waitress explicit instructions. We wanted them crispy and cooked all the way through. My waffle combo included hashbrowns, which seemed odd to me, but I wanted to try the grated potatoes again, since the last time I had them at that establishment they were of superior quality. I asked if the waffle was Belgian, which is what we call the tall waffles in this country. She said yes. My waffle, when it arrived was not Belgian, since it was about three eights of an inch tall. I suppose that it might have been a Frisian waffle. Or maybe Danish. At any rate, it was a couple of language groups distant from anything Belgian. It tasted fine, though. It is hard to screw up a waffle, unless one burns or under cooks it. When the hashbrowns arrived, they were exactly the opposite of what we ordered. A single glance told me that they were deplorable, undercooked slabs of starch with a faint hint of browning on the outside. Tim said that he was sure they were the worst hashbrowns he’d ever had. Mike just looked at them with disgust, then took a photo. Watch for his forthcoming report on The Hashbrown Diaries blog. It will be a fuller, more detailed account, no doubt. The root of the problem with the Soup Shoppe is a change of ownership and staff. The restaurant has been an institution in the city for many years, and that status was well deserved. I’m saddened to see it go the route it has. It is now just another incredibly average restaurant, one that I will have no particular desire to go to. Back outside the restaurant, the air was getting warmer, so we adjusted our gear, shedding long sleeve shirts and opening circulation vents in our leathers, before starting the motorcycle engines. We decided to ride down the 215 Freeway to Temecula, rather than take the back roads. 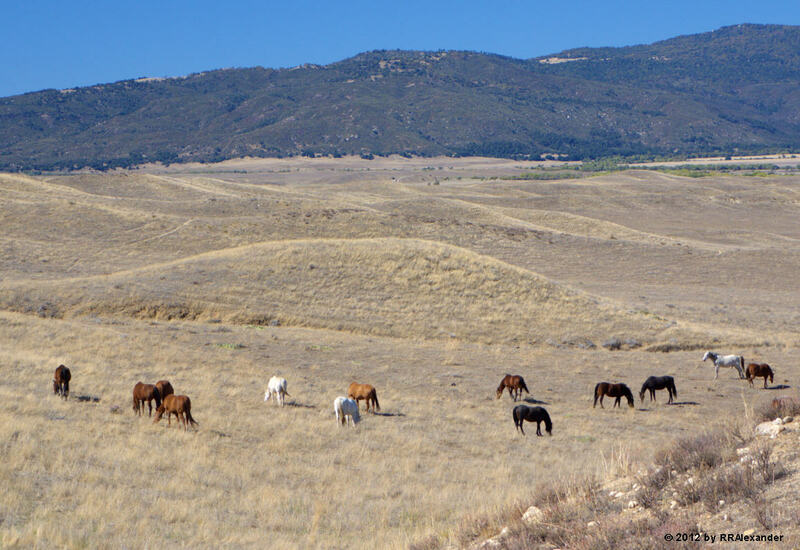 We’d arrive sooner at our destination ride area south of Temecula and head down Route 79 toward Julian. 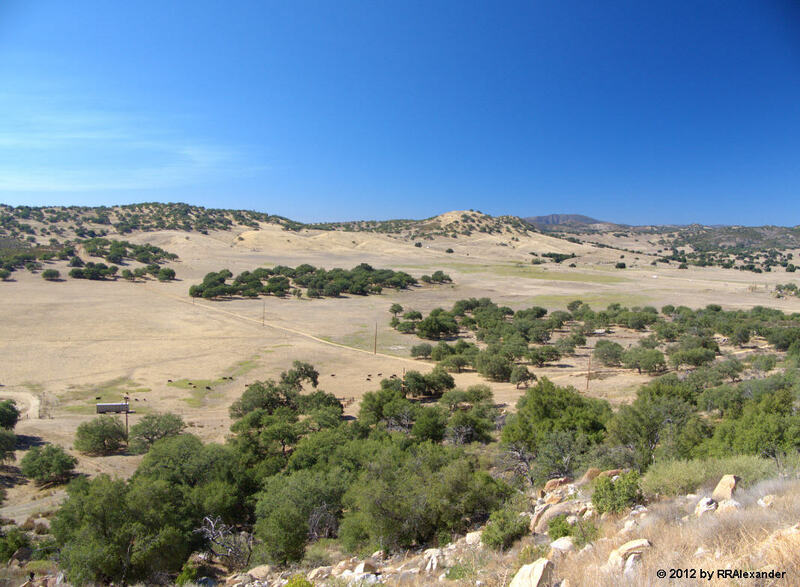 The secondary roads between Temecula and Julian are generally uncrowded, and the scenery is excellent, bounded in the east by the rolling Santa Ana Mountain. 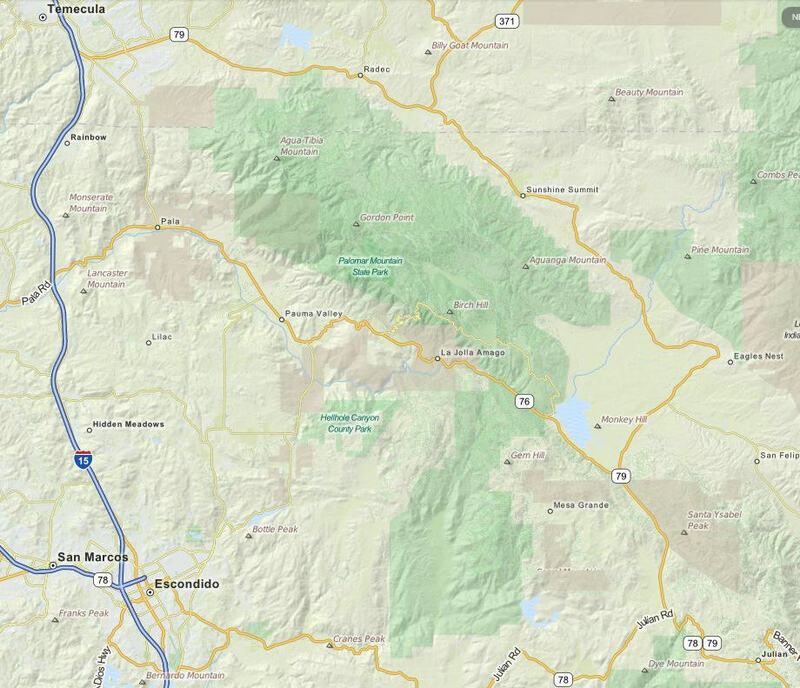 To the west, the long ridge of Mount Palomar splits the valleys east of the 215 Freeway that connects Riverside and San Diego Counties. There are plenty of roads webbing the relatively unspoiled (read: undeveloped) landscape. It reminds me at times of what the west might have looked like a hundred and fifty years ago (minus the blacktop roads, of course). 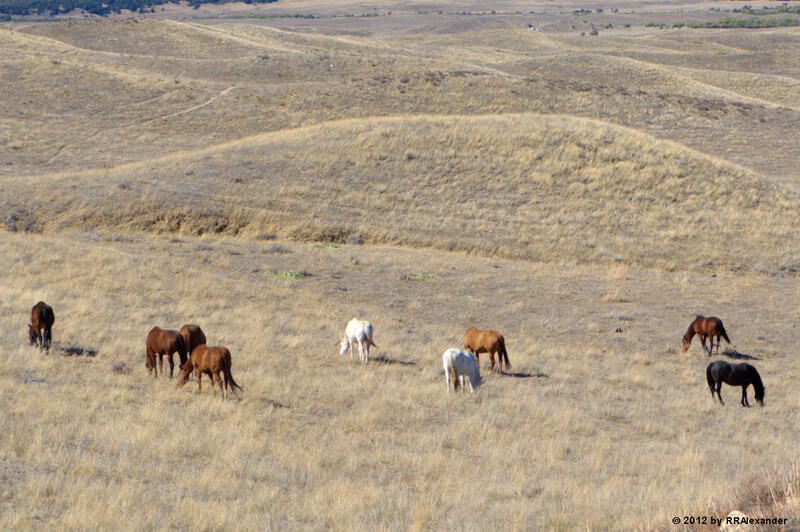 Thirty horses grazing near Route 79. 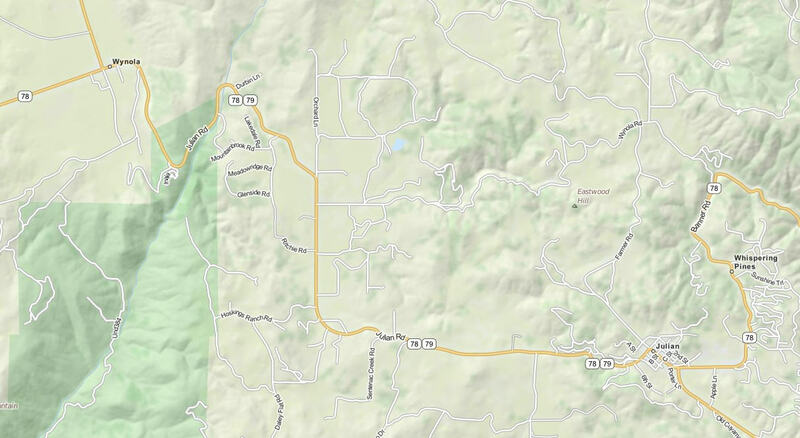 After way too many traffic lights between the freeway exit and the edge of the city, Route 79 narrows to a two lane road (one lane in both directions) and turns decidedly rural. It is a relaxing 55 Mph road for 46 miles to the junction with Julian Road at Wynola. 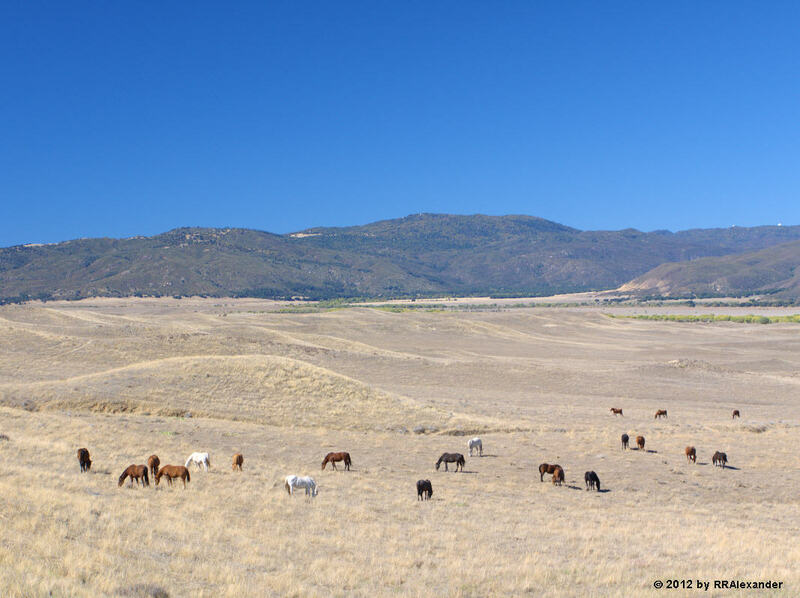 Just past the town of Warner Springs, we spotted the horses pictured here grazing on the west side of the road. We stopped a quarter mile down the road, then made a u-turn to go back and photograph them. The scenery isn’t the best during the fall, since the violently green grasses and wild plants have long since been bleached out by the sun and summer’s heat. But the faded, near-yellow plants carpeting the valleys have their own visual appeal. From Wynola to Julian the road rises slowly up along straights and long sweeping curves to an altitude over four thousand feet. The air grew increasingly cool during the ascent, and because of the warming temperatures in the valleys below, the change was welcome. When we stopped at the junction of the town’s main street it became quickly apparent that we had arrived at one of the less desirable times. The town is usually quite busy on the weekends, but the thickness of the bustle can be created by a couple hundred people or a couple thousand. That day it was the latter, which wasn’t a good sign. A crop of the above photograph. Julian is famous for the locally made apple pie and has a firm grip on the levers that control a long-lived and well-oiled hype machine. The machine draws in large numbers of people and feeds them the pie at inflated prices. It keeps the local economy humming. I’ve sampled the pie at various establishments over the years and in each case found it average. But we weren’t interested in pie, we were looking for beer and a table where we could sit for twenty minutes, watch the tourists, and enjoy the mountain air. Because parking options were so limited, it took us more than ten minutes to find space for three motorcycles in two places. Meeting at a restaurant where we’d easily found draft beer and a table in the past, we surveyed the crowd on the street and the large huddle of people waiting for tables, and decided to backtrack down the road where another series of restaurants and antique stores sat halfway between Julian and Wynola. View of the north valley from Julian Road. The tiny white object in the right distance is a tractor-trailer on Route 78. We found sanctuary from Julian’s crowds at a pizza joint that featured a large patio filled with umbrella covered tables and an extensive selection of beers. After the beer stop we stopped again on the long straight section of road leading down to Wynola in the valley below and photographed the straw-yellow valley. Returning north on route 79, we took the turn onto Route 76 and rode north on the west side of Mount Palomar through the towns of La Jolla Amago, Pauma Valley, and Pala before returning home on the 215 Freeway. Largely due to the warm weather, low winds and clear skies, it had been a good relaxing ride.